Today, I want to talk to you about having good habits. I don’t mean bad personal habits like picking fluff out of your belly button or chewing your finger nails in public or things like that. We’re talking about good habits that you need to do for work or could be for your private life. Now to give you the full transparency, I want to tell you about the Fogg Method that was created by Professor BJ Fogg. He is a Stanford University Professor and very, very clever and funny guy. You can find him online at foggmethod.com and it explains his method in full. I’ve been using this for quite a while. I saw a ted talk from him and saw him explain this in some other platform. It’s fantastic and it works. It’s really simple. I’m going to give you the funniest one because it’s his idea and I copied it and it’s working. Most of us who want to be fit, but just can’t get time to go to the gym and, yes, I’m one of those. There’s no way I’m going to the gym. The only way I’m going to go to the gym is if it’s in my house and it’s full of instructors who pull me in there and force me to do it. I still think I’d like to get there someday. I wanted to find a way so I started with push-ups. Now what you need is a result, so obviously I wish to get fit and improve my upper body strength and whatever else it does. And then you get specific, so I wish to do push ups. Then you need a trigger action, you need something that triggers that habit to happen. So when I do this, I will do that. This is where it gets a bit strange but bear with me because this was his idea. He suggested to do it this way — I will do one push-up every time I go to the bathroom. Now, I bet you are thinking, “Hah! How does that work?” But think about it — you must go to the bathroom at least 10 times a day depending how much water you drink . If you did push-ups after every time you use the restroom, before long you will have developed a good habit of doing a lot of pushups and getting your workout in. This is not a debate about the whole thing, just watch his video and explanation, but the point is you start tiny and you build up a habit. So you start with one push-up after maybe a week whenever you feel comfortable, you up it to two, a week later three, a week later four. I use this same method with my to-do list. It says every Monday as a recurring to do, I have upped it by one. Remember the other day I mentioned the commit app? I put this habit in my app and it comes back asking me every day if I have done x number of pushups. I am currently on 12 push-ups and yes every time I go the bathroom, I do my pushups. I can tell you, at the end of the day just before I go to bed, my arms are tired! I am going to push it as far as I can. I wonder if I can get to the end of the year and get up to fifty because I’m upping it by one each week? BJ Fogg has a lady that has a bad habit of not flossing. She brushes her teeth, so she associates that with flossing instead of actually doing the process. He told her to start thinking like this — Every time I brush my teeth I am going to floss one tooth. You’re going to think, “That is ridiculous, what’s the point?” But how about three days later you up it to 2 teeth, three days past that, you are up to 3 and then 4 and then maybe you’re going to feel comfortable and up it every single day. Do not be tempted to dive ahead, it gradually becomes a habit. I’m at the point where when I first started doing the push-ups, I used to forget, sometimes at the end of the day I think, “Oh no! I haven’t been doing my push ups.” Now I feel guilty if I couldn’t get down and do it like if I’m out in public. It’s become a habit, it’s great so I’m onto others. How about after I have my first cup of coffee, I will find a new Twitter follower and engage. After I finish my lunch, I will phone a past customer and chat with them or a new customer. By thinking like this, you need a trigger, a regular trigger that gets you going. It could be once a day at a certain time — everyday. Set a recurring time alarm. This way, you know what it’s going to be. Do something that is easy — like do 1 push-up then 2. So, for business — contact one Twitter person, who may be looking for information. Chat with them, and get to know them on Twitter. Do that everyday! A week later, do 2, a week later do 3, get to a point where that becomes a daily habit. That will get you into using Twitter. You can think of many ideas and ways to do this. 1. Grab your pen and paper. 2. 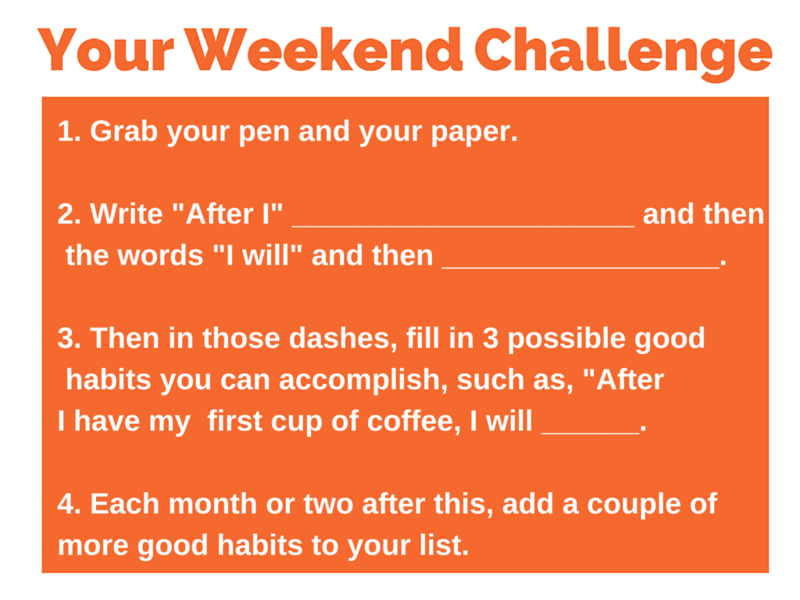 Write out, “After I” _____________ and then the words “I Will” _________________. 3. 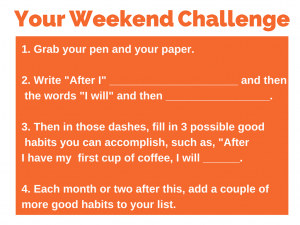 Then in those dashes, fill in 3 possible good habits you can accomplish, such as, “After I have my first cup of coffee, I will_________________. You get me? Write those down, come up with some good ideas. 4. Each month or two after this, add a couple of more good habits to your list. These are good habits. These are not repentance things, things that you want to do that you feel you ought to do that you can’t quite do. Now BJ Fogg has some excellent free resources. Another of his sites is called tinyhabits.com. He explains thoroughly how to do this. There’s a video of his ted talk there as well . You will also find a free online workshop. You will have someone email you to offer encouragement and give extra guidance on how to get this going. Honestly, this works. It’s going to help you. It’s going to change. Apply it to your business or your personal, but apply it to your marketing efforts. Do them one at a time. I love it when these things come together. 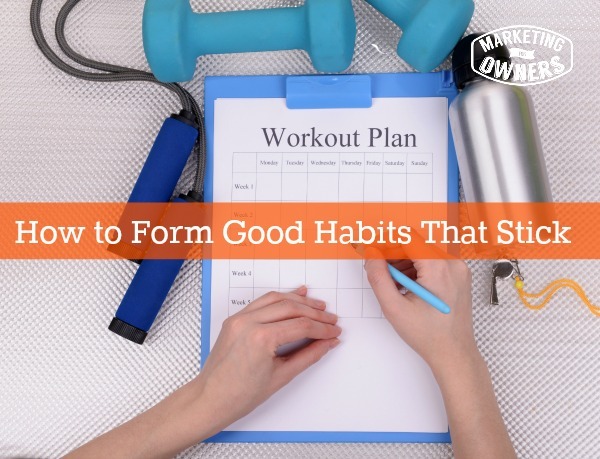 What good habits are you wanting to form?